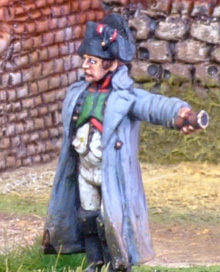 Dismounted vignette of Napoleon Bonaparte Emperor of France and Commander in Chief of the Armee du Nord Napoleon has a slightly excited look on his face in this setting. With him are Marshal Ney and a General of Division or staff officer. Subscribe to site news & extra gaming material FREE!!! Most of my news will be pretty obvious as new postings, material and photos will all appear regularly. To provide extra value to frequent visitors I will make available additional material which is not accessible through the main site.This is likely to take the form of original rules and gaming mechanisms, painting guides and scenarios. Enter your details below and let us take care of the rest!! !